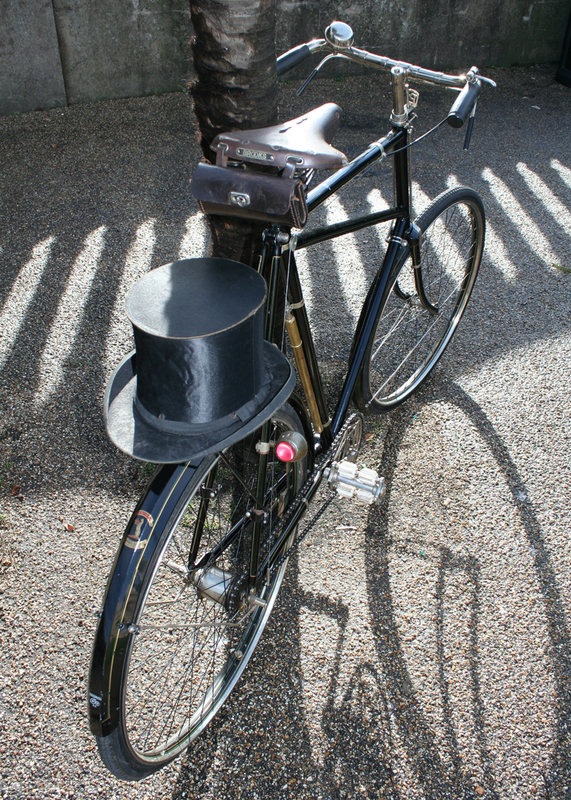 While bicycles were being developed in the nineteenth century, there was much resistance to their introduction. They represented such a revolution in transportation it’s hardly surprising. Two centuries later, we’re so used to wheeled transport it may be harder to appreciate how cycling challenged society. 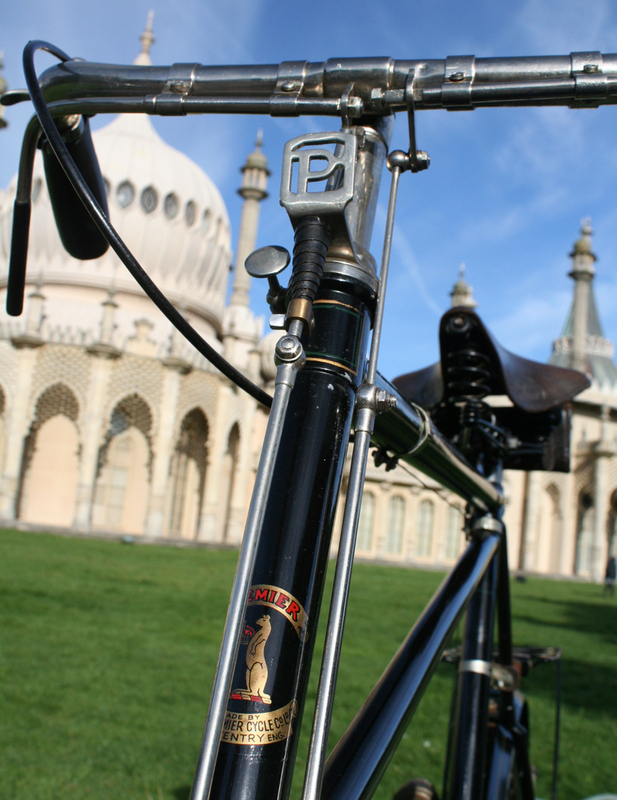 The Royal Family were instrumental in changing the public view of bicycles. 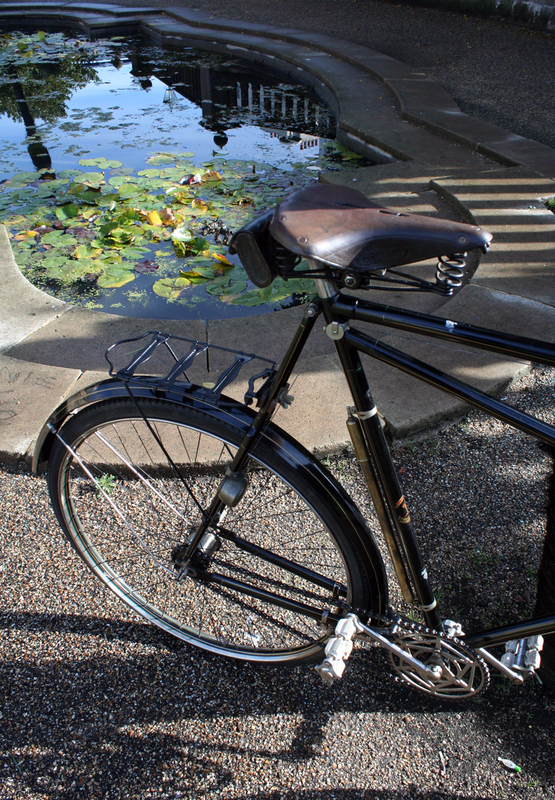 They wholeheartedly embraced this new technology: after all, Great Britain played a major part in both the invention and development of bicycles, and British companies were subsequently the world’s greatest bicycle manufacturers. There is mention of ‘four well-painted Dandy Chargers’ being delivered to the Royal Pavilion in Brighton in Spring, 1819, for assessment by the Prince Regent. 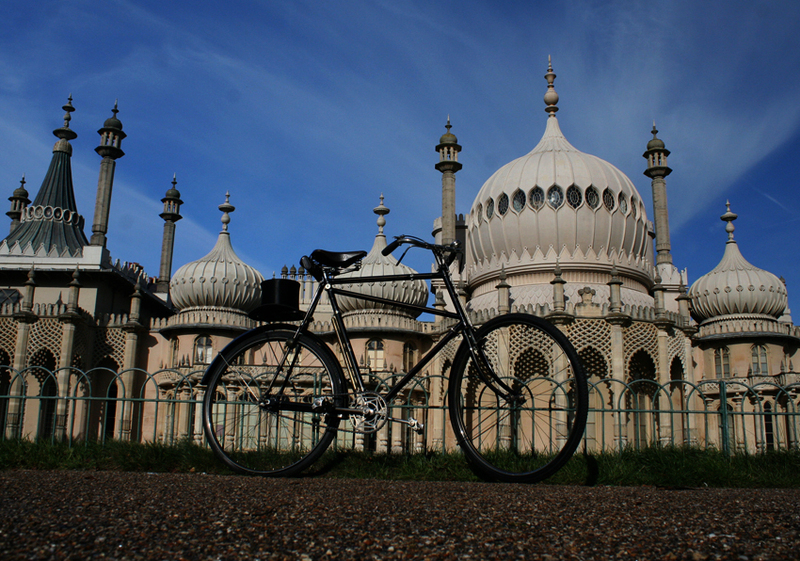 Presumably Brighton became the base for journeys on the new machines. 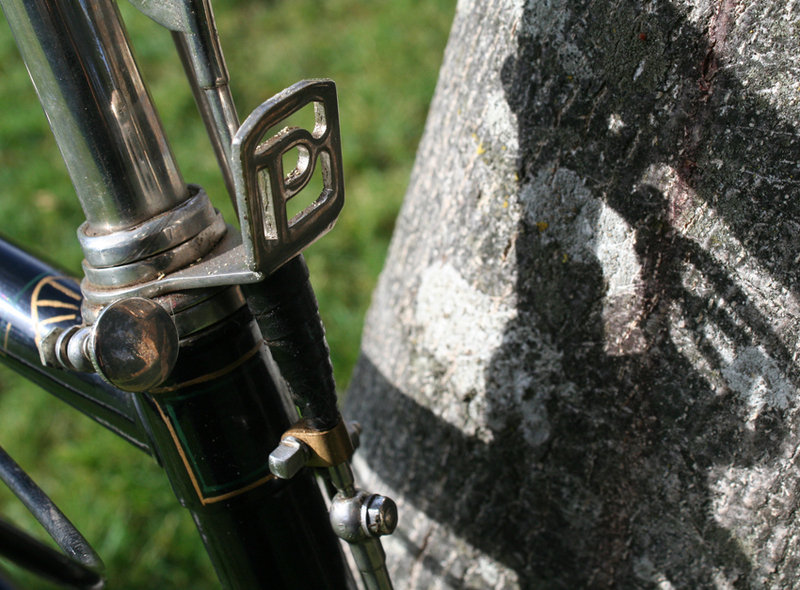 The Prince Regent’s young brother, the Duke of York, may also have owned a hobby-horse. In 1881 Queen Victoria purchased two Salvo tricycles from Starley Bros and, above, you’ll see a photo of the Royal Family astride tricycles in 1882. 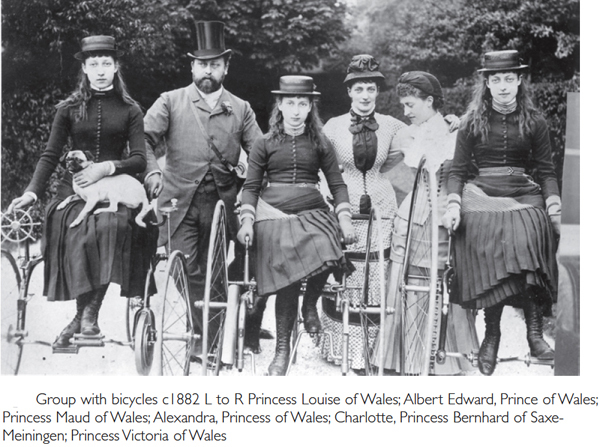 It was fashionable for Victoria’s children to marry Europeans, so riding became popular in European court circles too; thus the bicycle became socially acceptable …and the British cycle industry benefited greatly. 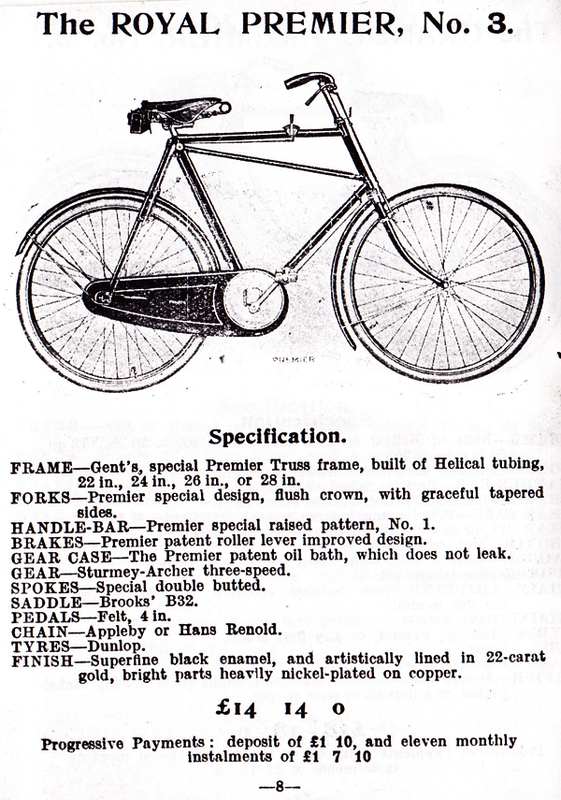 In 1898, Edward, Prince of Wales, ordered a bicycle from Premier Cycle Co Ltd, the frame presumably built in the company’s special helical steel tubing. The purchase was probably made on the advice of his brother Prince Arthur, Duke of Connaught, who had bought a Premier the previous year. 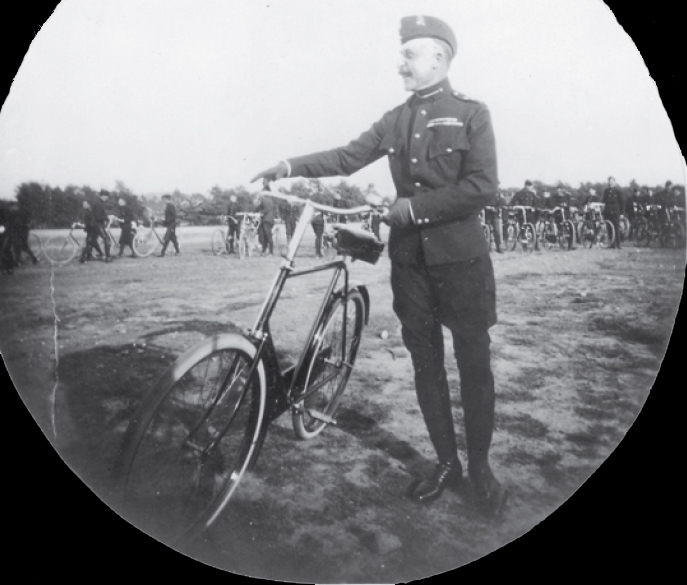 Prince Arthur pursued a military career and at one time commanded a Cyclist Battalion (above). This model was accordingly named the ‘Royal Premier’ – hence the setting for my photos of this example at Brighton Royal Pavilion. 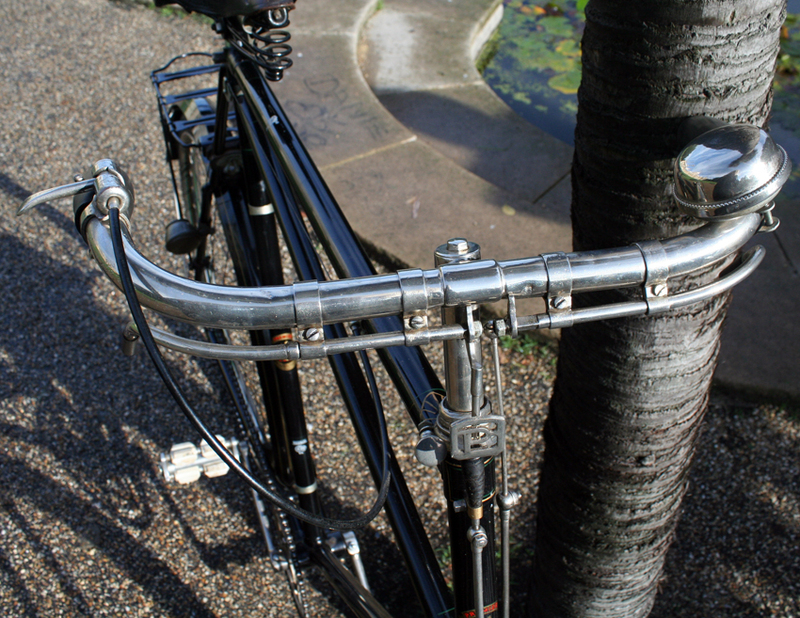 The nickel handlebars are an outstanding feature of this bicycle. You may have noticed covers over the handlebar grips. 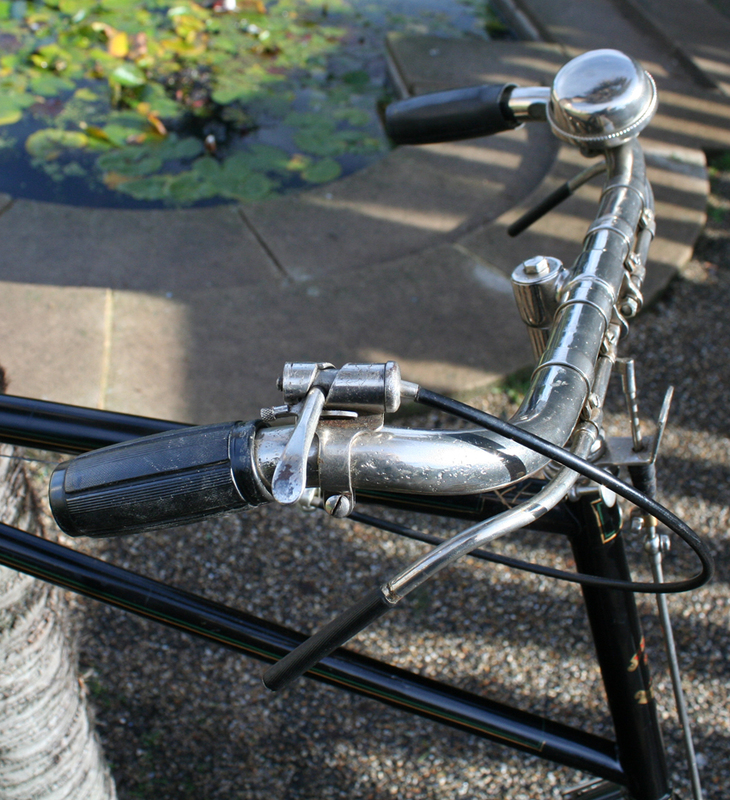 Grips are one of the most delicate items on a vintage bicycle, and original 100-year-old grips are best protected. The right-hand grip is exposed below. By helping the British colonialists in suppressing the Revolt of 1857, the Punjab Sikh chiefs and soldiers had saved the empire. The Sikh soldiers were taken in the army first in 1846. During 1853-54 they crushed the Santhal rebellion in the Ganga valley. In 1860 the Loodhiaah (Ludhiana) Regiment conquered Hong Kong and Peking. For half a century Sikh ‘soldiers of the Queen’ were instrumental in suppressing the revolts by Pathans in the North West Frontier Province. They were also involved in the overseas campaigns in Abyssinia (1867), Malaya, Egypt (1882-1885), Burma (1885), Afghanistan (1878-1880), East and Central Africa (1891- 1898), and South Africa. 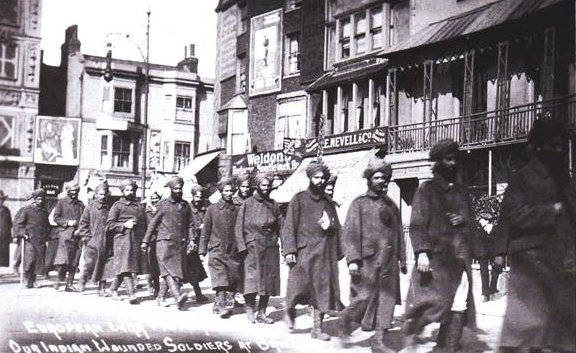 According to an estimate, total 70,000 Sikh soldiers lost their lives in World Wars I & II. 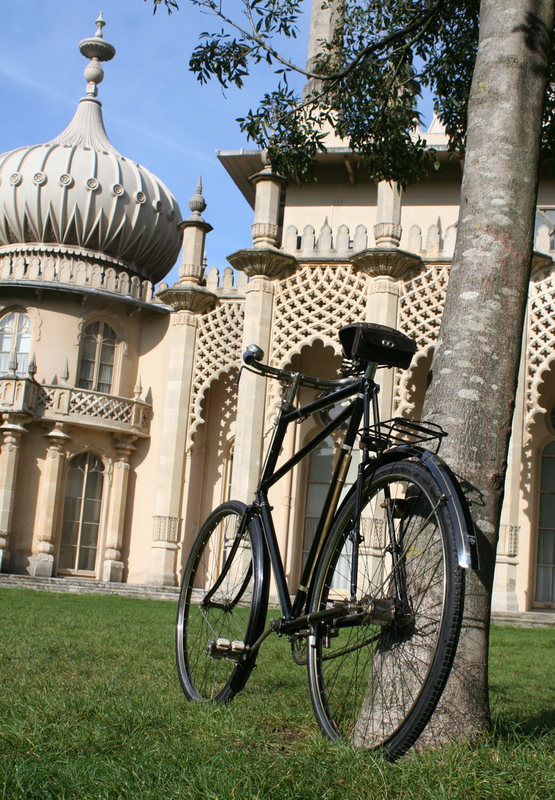 Indian soldiers were rightly seen as war heroes in Britain and, in 1914, Brighton’s Royal Pavilion became a hospital for wounded Indian servicemen. The Indian National Congress under the leadership of Gandhi supported the British war efforts in WW1 in the hope of attaining dominion status. Gandhi actively encouraged Indians to enlist and contribute to the war fund. Of around one million Indian soldiers fighting for the allied cause, half were drawn from the Punjab. Of the total numbers serving in all theatres of war between 1914-1918, there were about 1.3 million Indian and Gurkha troops of whom 827,000 were combatants. The India Corps contributed one in ten troops to the war effort. On 8th August 1914 the first Indian troops to fight in World War I left India headed for Egypt to be held in reserve. However the fighting on the Western front was so desperate that they were needed on the front line instead of being kept in Egypt as reservists. So the troops were redirected to the fighting on the Western front in Europe. Still dressed in the khaki uniform suitable for Egyptian not European weather, the troops arrived in France on 26th September 1914 ready to battle. The India Corps provided 20 per cent of forces on the Western Front, holding eight out of the 35 miles of the Front. By the end of 1915 almost 30,000 Indian and Gurkha troops were on the Western Front of whom at least 3,000 were killed and 14,000 wounded. In all theatres of war (1914-1918), over 62,000 Indian and Gurkha troops were killed and over 66,000 wounded. Soldiers wounded in battle on the Western front needed to be hospitalized somewhere. Originally it was hoped that the wounded Indian soldiers could be hospitalized in France, but the number of casualties was so great that this was not possible, and alternative arrangements had to be made to accommodate the wounded soldiers. 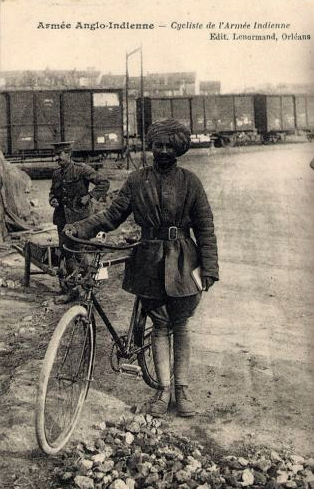 Between 1914 and 1916 Brighton had the greatest concentration of Indian military hospitals in the country. The Royal Pavilion was one of three hospitals; the others were at the workhouse (now Brighton General Hospital), and the municipal schools at York Place and Pelham Street. The troops were brought to Brighton by ambulance trains and local people turned out to cheer their arrival. 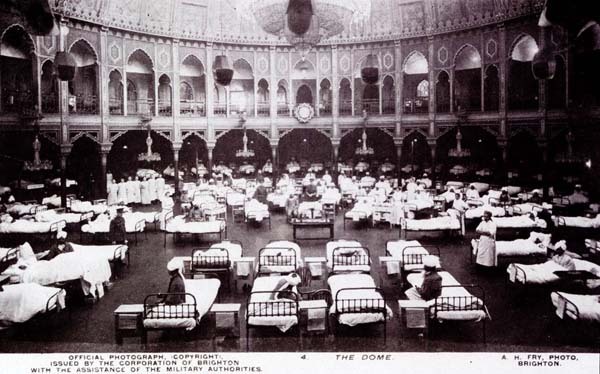 Around 12,000 troops passed through the three hospitals, of which 4,306 were hospitalized in the Dome, Corn Exchange, and Royal Pavilion. 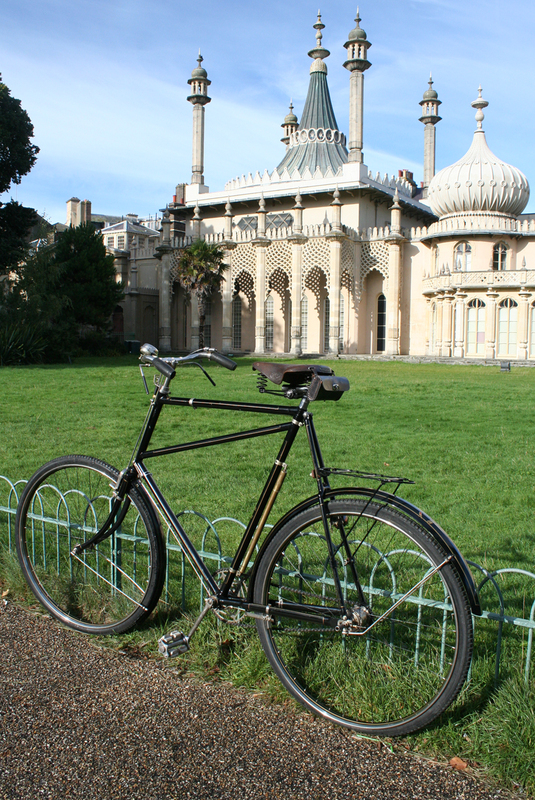 All three buildings were included in the Royal Pavilion Military Hospital, which contained 722 hospital beds. 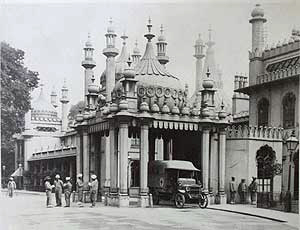 Every attempt was made at the Royal Pavilion to conform to the sensibilities of the troops from Britain’s Indian Empire. A Sikh temple was a marquee erected in the Pavilion grounds, and Muslims were able to use the lawn in front of the Dome, as this was facing East. Nine different kitchens, divided into three types (including vegetarians), were provided for different religions. There were different water supplies for Hindus and Muslims and the wounded were cared for by orderlies of the same caste or religion. Most of the 4,000 or so patients treated at the Royal Pavilion survived, but 32 died. Hindus and Sikhs who died were cremated on the Downs near Patcham, on a specially built burning ghat where the Chattri memorial was later built. Muslim soldiers were taken to a specially established Muslim Military Burial ground at the Shah Jehan mosque in Woking. After WW1, Great Britain reneged on its promises to India for autonomy. It was only after WW2 that India achieved independence. This Royal Premier is in excellent condition. 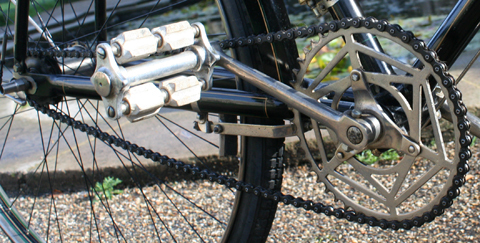 The specification is as original, with the exception of the chaincase, which is missing. I have one. 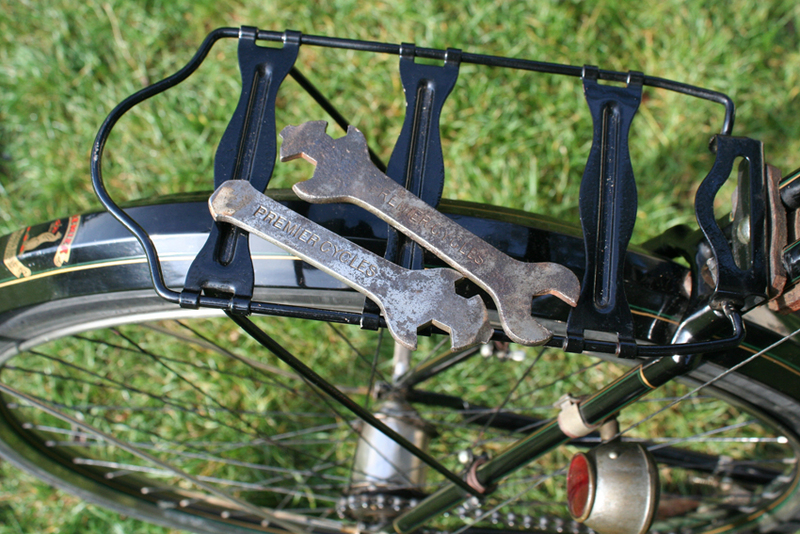 The saddlebag houses several Premier spanners (below). 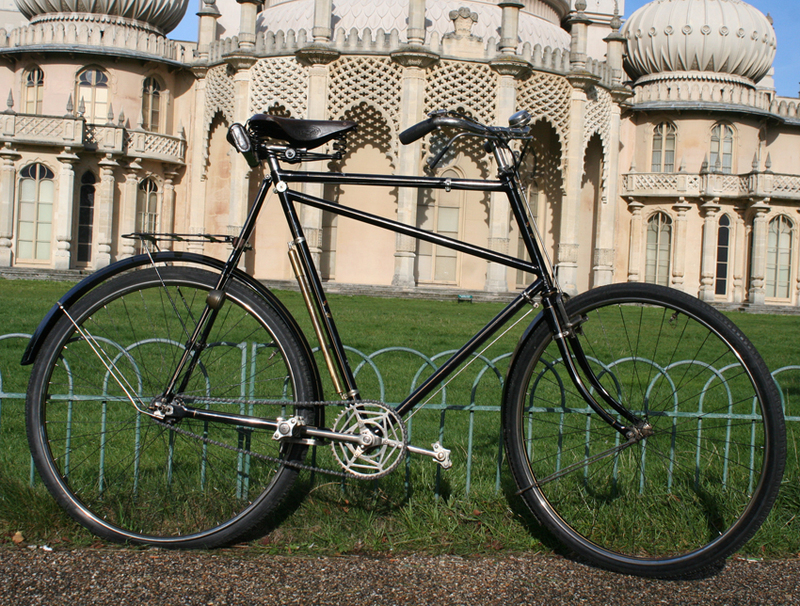 ‘The early 1890s were a time of enormous technical advancement in cycle design and manufacturing technology, a time when the basic form of the modem bicycle was perfected and set on course for the next century. 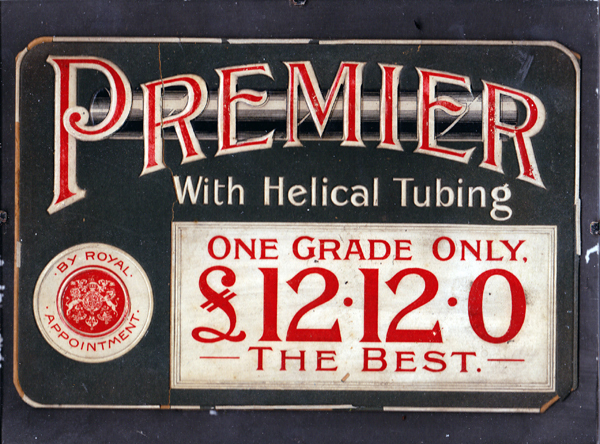 One of the more surprising inventions at this time was a 19th century equivalent of Reynolds 531 frame tubing, Helical tubing, which was developed and patented not by a tube manufacturer but by a cycle manufacturer. 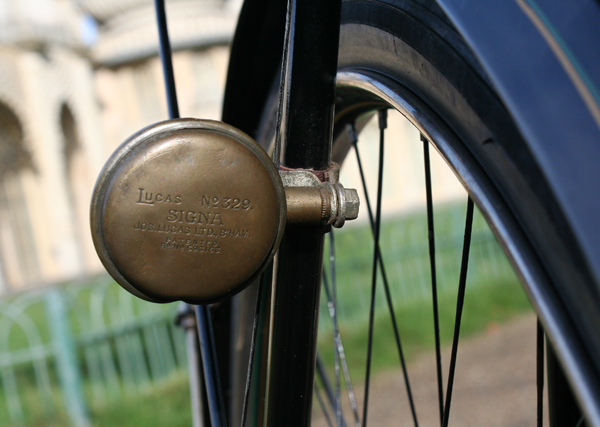 The inventors & patentees were The Premier Cycle Co Ltd, formerly Hillman Herbert and Cooper of Coventry, who claimed at the time to be the largest cycle manufacturers in the world. 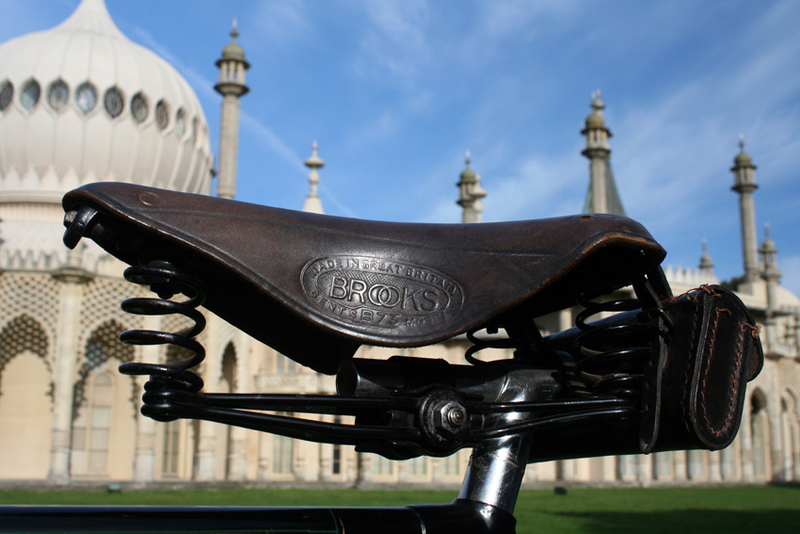 Founded in 1874, this company had been important innovators in the industry, introducing such advances as the DHF (double hollow fork) in 1878 (later licensed to Singer), the Kangaroo front driving safety in 1884, and the first true cross frame safety in 1886. 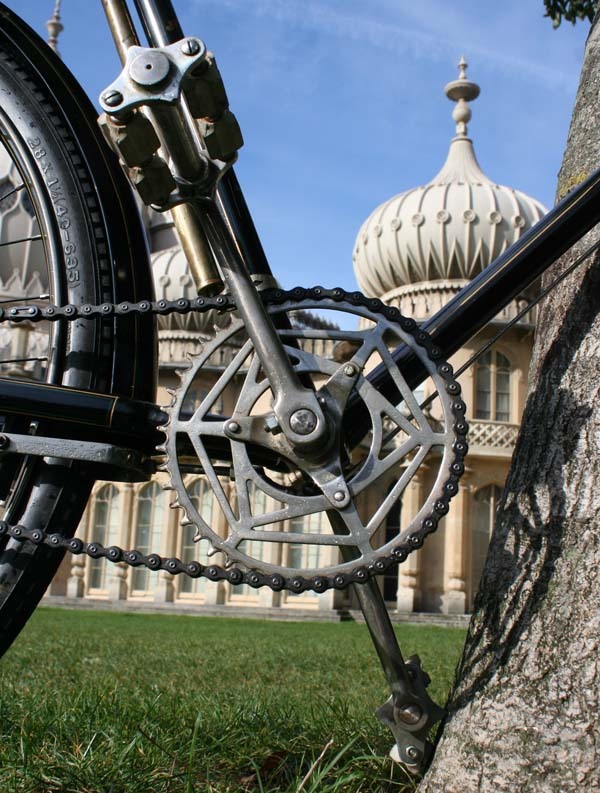 The driving force was William Hillman, a talented and practical engineer who had been in cycle manufacture from the birth of the industry in this country. 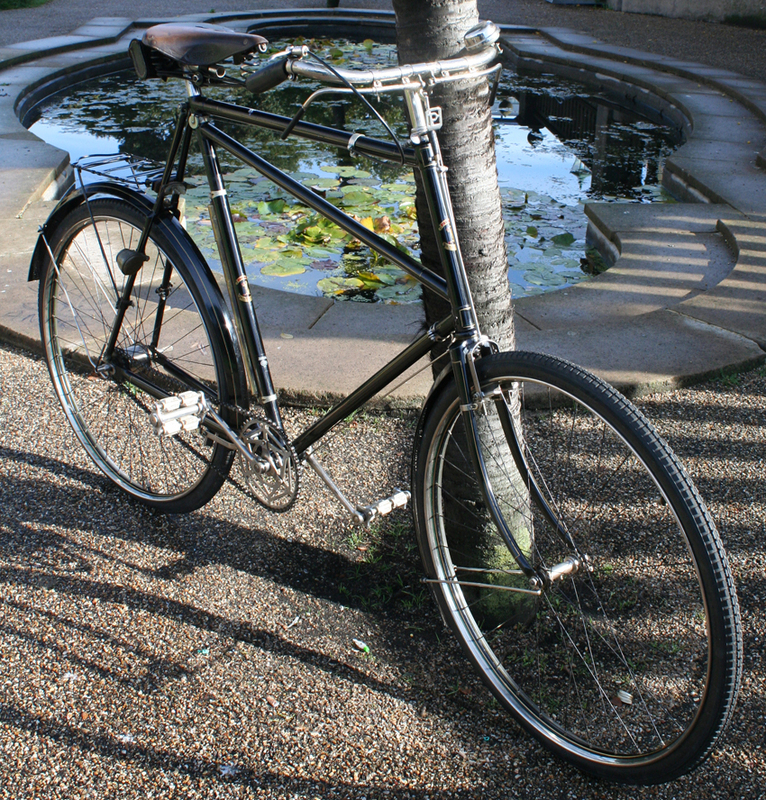 Many inventive and unusual frame designs were made by Premier in the closing years of the solid tyre era. 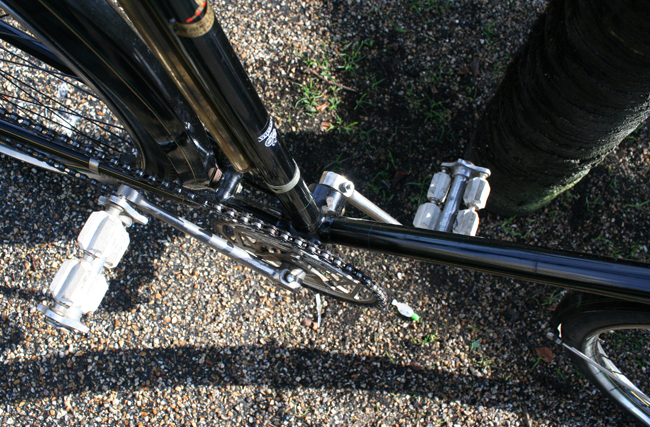 With the coming of the pneumatic tyre, the need arose for a light and responsive frame of thin walled steel tube, but there were limits to how thin and therefore how light ordinary tubing could be made, before its efficiency was impaired. 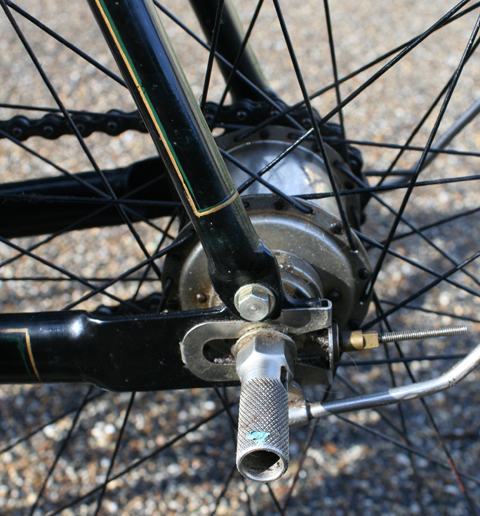 The rear hub is a Sturmey Archer model X, which was introduced in this year, and supplied as standard to the Royal No. 3. Its serial number is X29647. 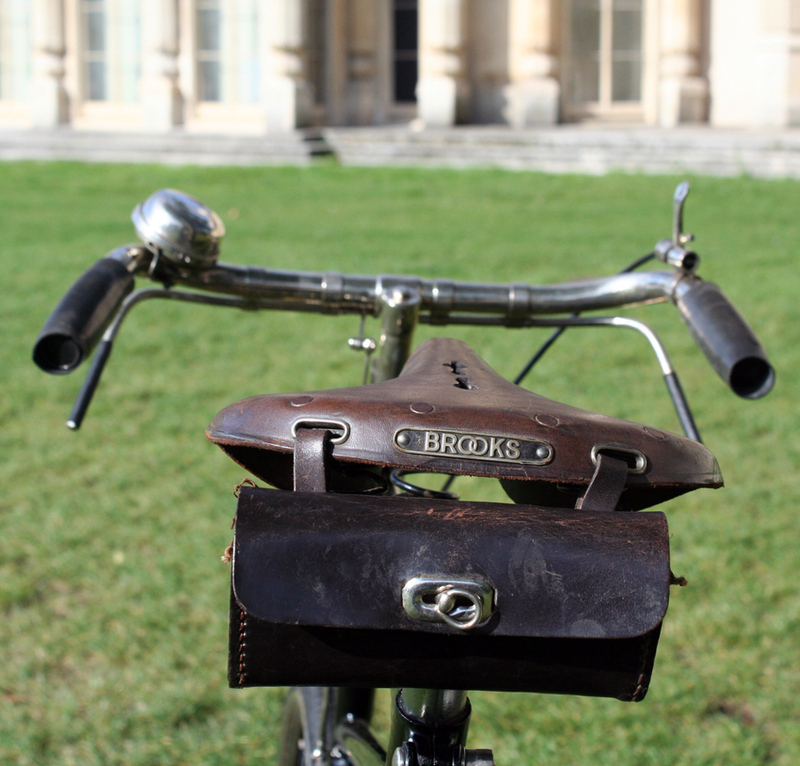 Royal Family information, thanks to – Boneshaker magazine, issue 167. * Premier Helical tubing article – thanks to Roger Armstrong, Premier marque specialist. 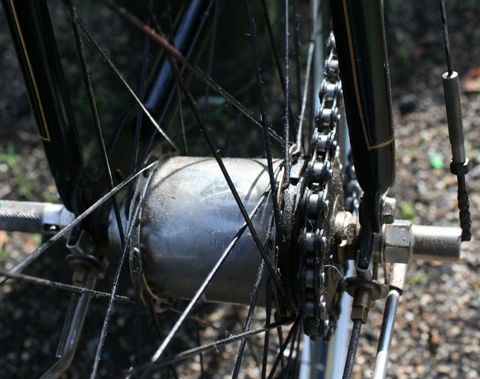 (Thanks also, Roger, for confirming the age of this bike).